Gen. James Thurman, the outgoing commander of U.S. Forces Korea, on Thursday received a top military award from the local government for successfully leading American troops in defending South Korea amid heightened tension with North Korea. 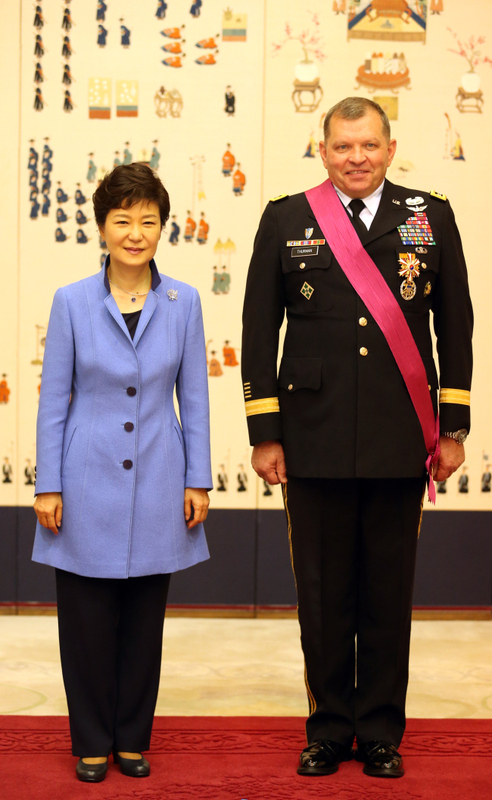 President Park Geun-hye granted the Order of National Security Merit’s Tongil Medal to Thurman in a ceremony, which was attended by South Korean Defense Minister Kim Kwan-jin and other top commanders. “I am deeply honored and humbled to serve in the Republic of Korea with the great ROK-U.S. combined joint team. The mutual trust, common values and commitment to security and prosperity are evident in the vitality and stability of this great nation,” Thurman said during the ceremony held at the presidential office Cheong Wa Dae. Gen. Curtis Scaparrotti, a veteran commander who served combat tours in Iraq and Afghanistan, will officially replace Thurman in a change-of-command ceremony slated for early October, military officials said. Scaparrotti has been serving as director of the Joint Chiefs of Staff at the Pentagon and previously was the No. 2 American commander in Afghanistan. As the head of USFK, he will also lead the South Korea-U.S. Combined Forces Command and the United Nations Command which monitors the truce on the peninsula. The new commander comes at a critical time for the alliance between Washington and Seoul, with major changes looming over the location of the American base and the transfer of wartime operational control (OPCON). As Pyongyang continues to advance its weapons program following a third nuclear test in February, the two nations have been discussing whether to delay the scheduled transfer of OPCON to South Korea in December 2015. South Korea handed over its OPCON to the U.S.-led U.N. troops during the Korean War and regained peacetime OPCON in 1994. Currently, the South Korean military remains in command under normal armistice circumstances, but the U.S. commander, dual-hatted as UNC commander, would assume OPCON of the two nations’ forces if war broke out. About 28,500 U.S. troops are stationed in South Korea as the 1950-53 conflict ended in a ceasefire, not a peace treaty.